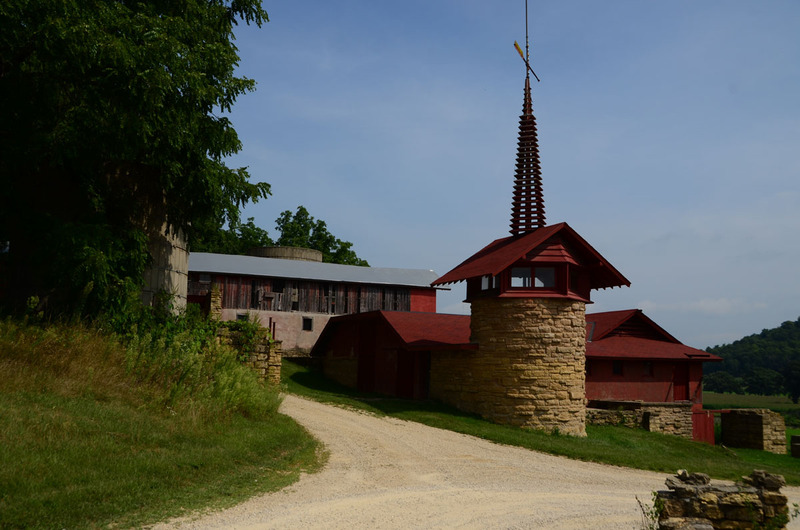 This was my third trip to Taliesin in Spring Green, WI so I took the opportunity to do the four hour “Estate Tour,” an expensive, but comprehensive, look at the property and Frank Lloyd Wright’s career and life. I made the reservations in advance – and was duly informed that the tour involved hiking over uneven ground, rain or shine. The day of our visit however, the temperature was well over 90 degrees (and that part of it I don’t recommend – try to pick a time of year when neither rain nor excessive heat will be a factor). From prior experience, I knew that advance reservations are necessary to get on a specific tour. Interestingly, our guide told us that the number of tourists to the property has dropped in recent years, probably due to the general state of the economy. But, though expensive, one of the main sources of revenue for the maintenance and preservation of the property comes from the visitor fees. A drop in visitor fees translates into projects half done, rooms closed, etc. I will mention again that if we want culture to be a part of our lives (art, museums, music, etc.) we have to support it. If we cannot visit, donations are always welcome and most needed! We met for the tour in the visitors’ center, a building designed and built in Frank Lloyd Wright’s style. There is a lot of merchandise for sale – beautiful objects as well as plenty of books, t-shirts, scarves, etc. It was here that we met our guide, Margaret. Margaret is a retired actress, voice coach and an exemplary tour guide: extremely well informed about her subject, familiar with the books written recently about FLW, eager to entertain questions and a pleasure to listen to. She really imbued her tour with her passion for FLW. 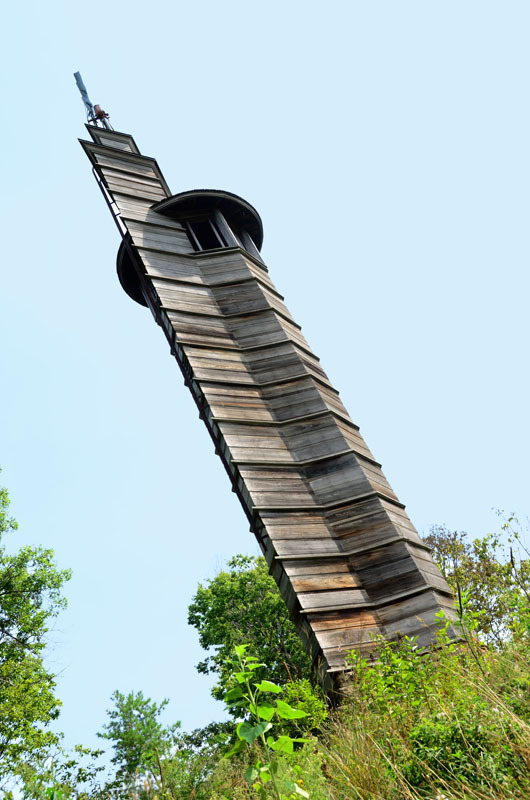 The tour started fo us at the Unity Chapel, one of the first buildings FLW worked on as a commission for his relatives. By we did not get to visit the interior, (and even the interiors we could visit could not be photographed) but we could peer in the windows. At the time it was built, FLW was working in Chicago and FLW collaborated with Chicago architect Joseph Lyman Silsbee on the design of the chapel. 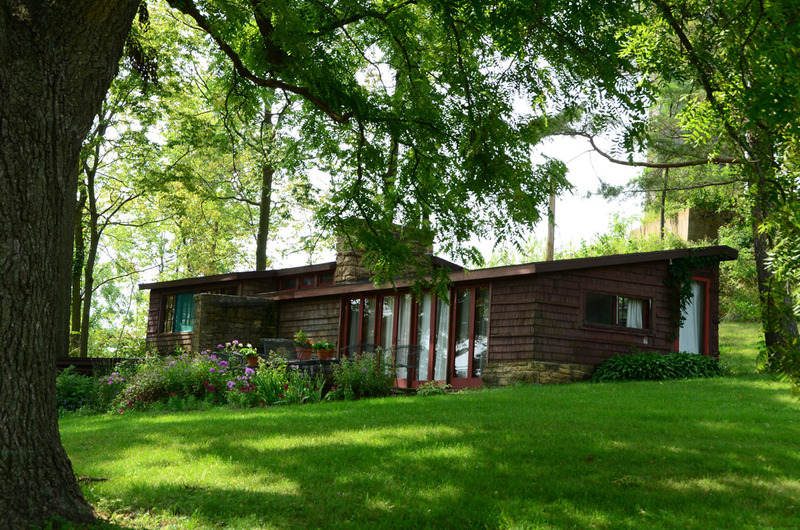 As a result, it lacks many of the features that later would define FLW’s style. 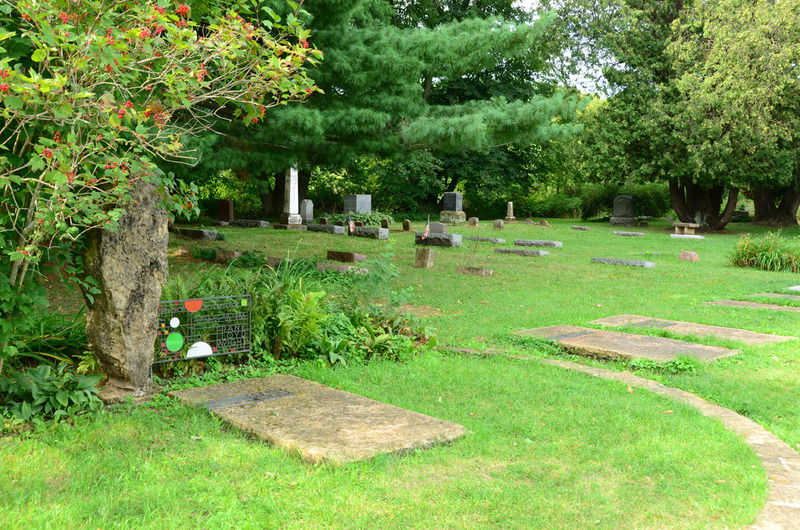 Next to this family chapel (now used for concerts, weddings and other events), is the family cemetery. Though there is no marble grave marker for Mamah Borthwick Cheney, she is buried in the cemetery under a now giant pine that FLW planted when he buried her. Most of FLW’s children by his first marriage are buried there also. FLW has a grave site in the cemetery, but his third wife apparently had his remains removed from the family cemetery and moved to Taliesin West and buried with her there. Next we visited the Hillside School. 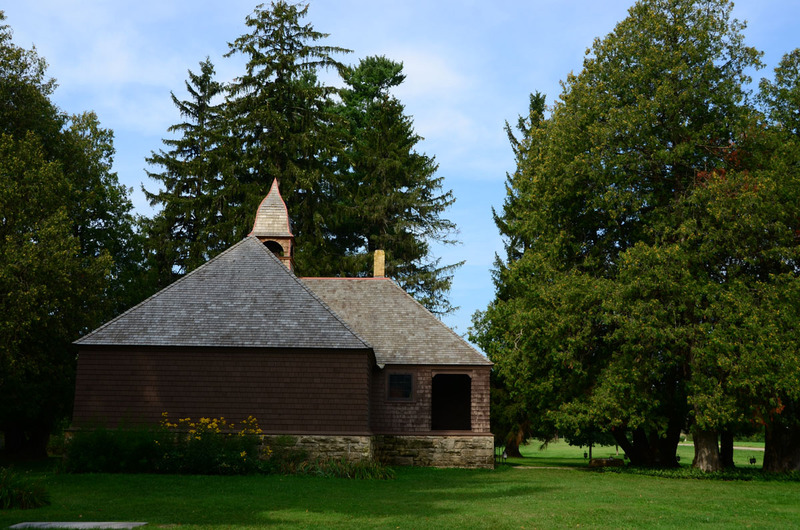 This beautiful structure was built by FLW for his aunts, who ran a boarding school for boys and girls. Much of the structure is now part of the architecture school, and the apprentices and professors use the meeting room, the dining room and other areas. Attached to the Hillside School is the drafting room for the architecture school. A large open space with work space for all the students and professors, it is lit with the indirect light that comes from the unusual roof line. Hillside School, to the left, and the newer drafting studio to the right. Next up was the theater. A gem I remembered well from a previous tour, I had forgotten the low roof that helps to move people out of the entryway and into the space itself. This was also the first time I got to see the magnificent curtain that serves as a backdrop for the stage, and to sit in the theater as we listened to our actress/guide. She shared with us that she had been in the theater the night before for a concert…a touch that helped to make her presentation more real and personal. From the theater we moved up the hill to see the Romeo and Juliette water tower. A diamond and a hexagon combine to create an interesting structure where the shapes of the two parts work together to maintain the structure upright without interior supports. A frontal view doesn’t reveal anything unusual, but from the side, it is amazing! Romeo and Juliet from the side. From the tower we walked around to see the “city house” that FLW built for his sister. He didn’t think that this Oak Park house fit in with the countryside of central Wisconsin, but she prevailed. 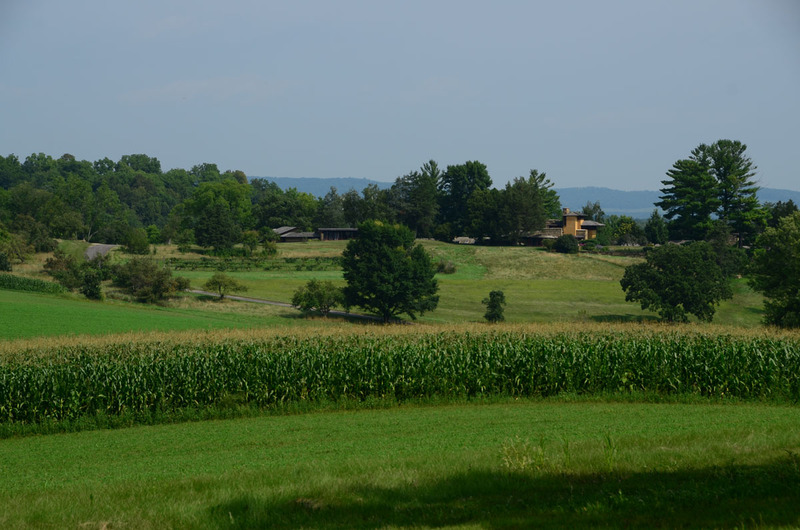 The house looks out over the fields to a view of Taliesin. Currently under maintenance we could not visit the interior of this building either. 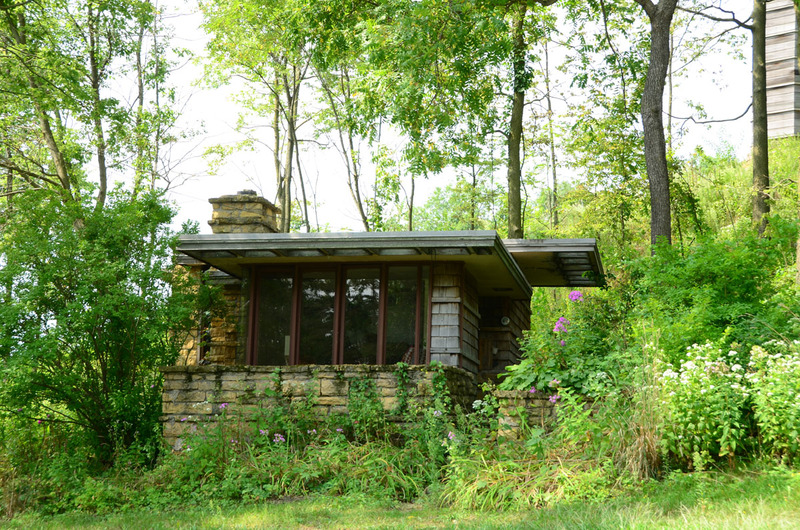 I suspect that it could serve as a window into the style FLW perfected in the Oak Park area, and become a part of the tour that focuses on his style, something that I would really like to see developed in the future – for my fourth visit? 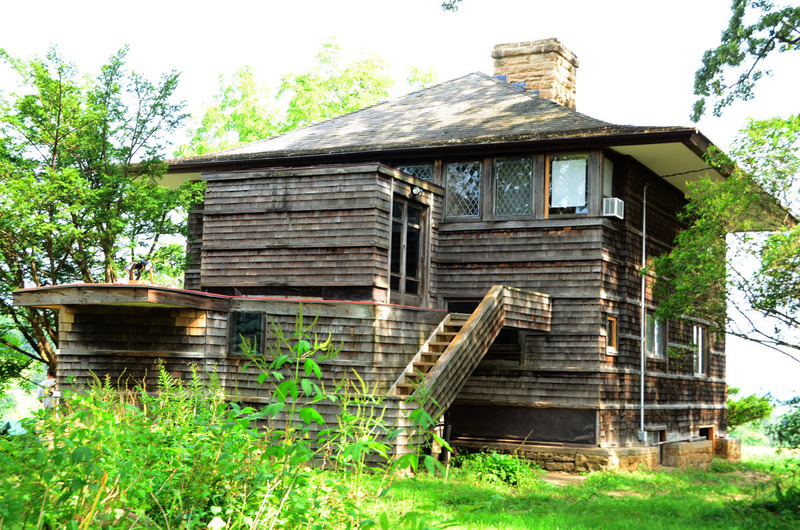 FLW’s sister’s house – the “city” style he felt was out of place here. View from FLW’s sister’s house looking towards Taliesin. 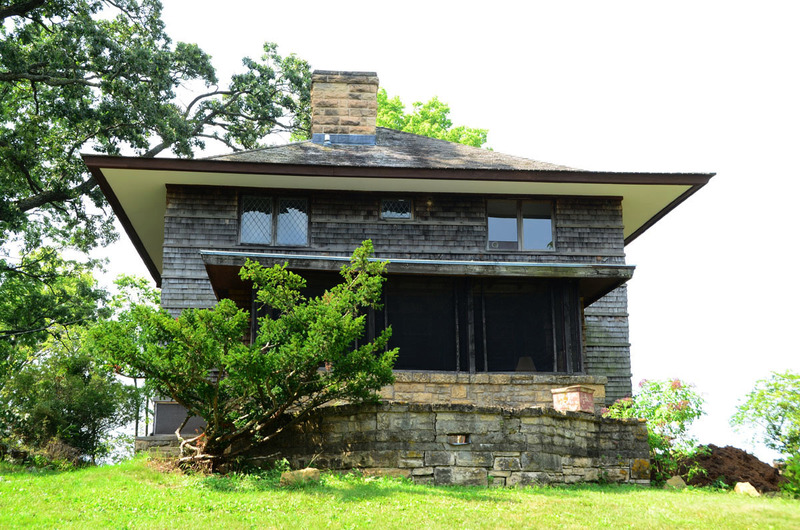 Most of the buildings on the Taliesin estate are currently occupied by the professors of the Frank Lloyd Wright School of Architecture. Falling into that category, we could not see the interiors of the next couple of houses we saw. These small houses were samples of the Usonian style, small affordable, architect- designed houses that FLW imagined for the middle class. It would have been fascinating to see them, especially because they are so small. A usonian house, now used by a FLW School of Architecture professor. From the this area we walked toward the barn. 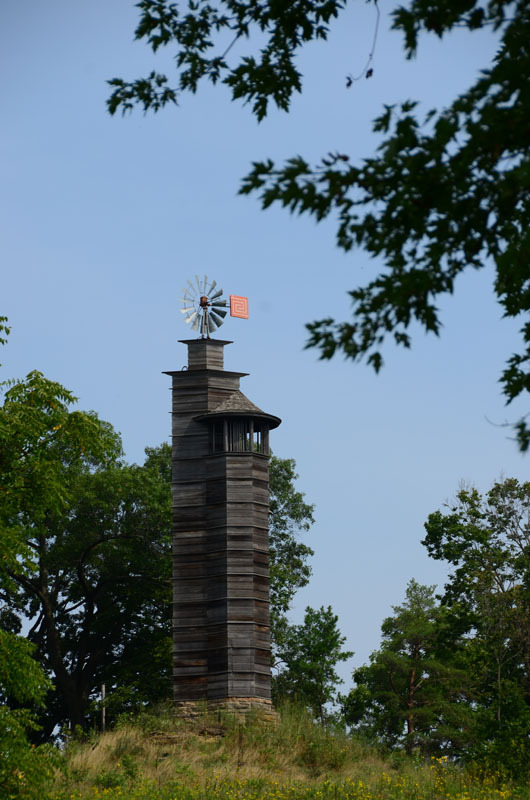 Taliesin was a working farm, really more like a commune, throughout its existence, with apprentices working in the fields as much as in the drafting room. Finally we approached Taliesin itself. (Thankfully, we got a refreshing lemonade and scones on the patio, first.) Walking around the exterior of the house, we could see the different additions, as well as appreciate the way the building works with the hill, conspicuously not located on the crest, but flowing down the sides. Our visit to the interior began in the public areas of the house, where the architect would have received possible commissions and entertained professionally. We also got to visit the family areas, to walk out onto the space where Mamah and her children died, to see changes made by Olgivanna, the third wife, to discuss the fires and the subsequent rebuildings of the house. We were truly immersed into the architect’s life. I was an art history major in college and the history of architecture was my primary interest. No history of architecture could be complete without a thorough appreciation for the role that FLW played in the development of modern architecture. That he is a Wisconsin native is something we Wisconsinites can be truly proud of – perhaps prouder of his genius, than of his difficult personality. Having visited this property three times, yes, of course, I recommend a visit! If architecture or FLW are not specifically your thing, still take one of the shorter tours. This is a piece of history that everyone should be exposed to – just because of the effect that FLW had on our modern world. 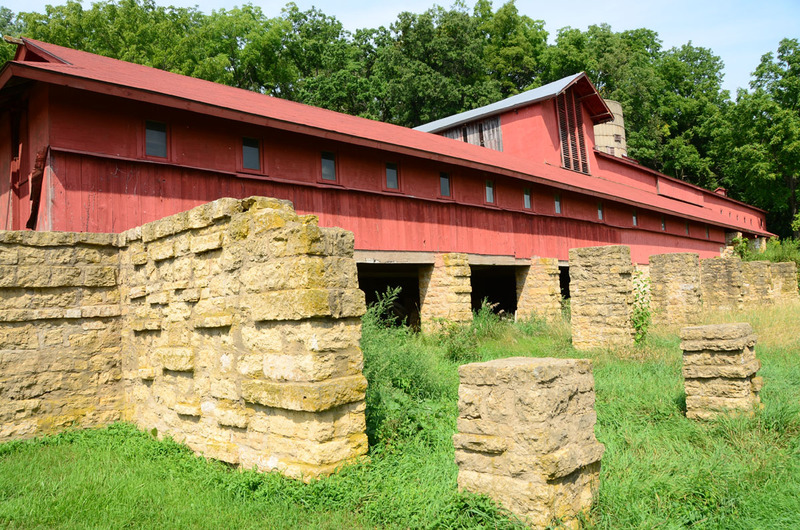 Here’s a link to the Taliesin website for hours, directions and tours. If you do go for a shorter tour, there are cheese makers and even the Wollersheim Winery in the area – also worth a special visit!